How the fires might affect California wine. The vines that do survive might be tainted. We simply don’t know enough yet. 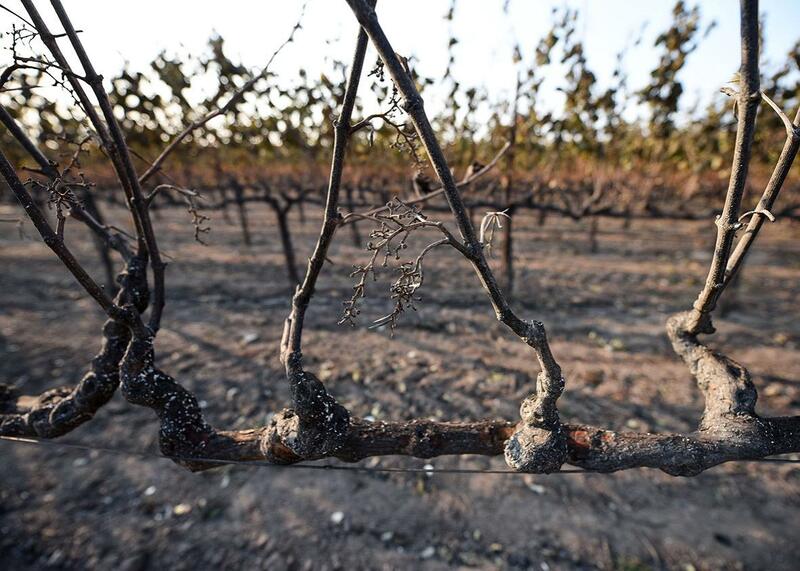 Grapevines damaged by heat from wildfires are seen at a vineyard in Santa Rosa, California, on Oct. 11. Grapevines go dormant in the winter, losing all their leaves. Though they look dead, with leafless branches and rough, gnarled trunks, their buds are still developing, and by spring, they are ready to uncoil and emerge. This coming winter, though, some of the skeletal-looking vines in Napa and Sonoma may really be dead, killed by some of the most intense forest fires the area has experienced in recent memory. There are 45,000 vine-growing acres in the Napa Valley and 60,000 in Sonoma, together producing the most highly prized and highest-priced wine in California. It’s not yet known how many plants in those acres have been damaged by this month’s fire—buildings destroyed and human lives lost can be counted, but grapevine loss is harder to see. Vines, like all plants, are unable to flee from catastrophe, so instead, they have evolved strategies to regenerate. Some of the chaparral and native trees, including the famous scrub oaks, on the slopes above the Napa and Sonoma valleys actually depend on fire for reproduction. The wine country vines, though not native, are tough, capable of forming deep root systems and withstanding drought. Given the right soil and climate (and the absence of pests and disease), they are not easy to kill. Grapevines are in the family vitaceae; relatives are Boston ivy and Virginia creeper. They want adequate sun and not necessarily rich soil, but soil with good drainage. Even if the aboveground plant parts are severely damaged, the roots can send up new shoots in the spring. That sounds promising, but it’s not that simple. Vines for wine have been manipulated for centuries—tweaked for qualities like sugary versus savory, or the thickness of the grape skin. The fruiting part of the vine is grafted to a different rootstock, usually one with vigorous growth and resistance to disease. They may have vigor, but the new shoots springing from that rootstock bear fruit that is undesirable for winemaking. To make a comeback, the aboveground part of the plant has to have escaped severe damage. What research has been done is largely in Australia, where bush fires have been increasing dramatically since 2002. The Australian Wine Research Institute publishes a fact sheet for growers on grapevine recovery from fire. Slight damage, such as some shriveled leaves, has little impact on growth or fruit production the next season. Medium intensity damage, in which the vine is scorched but has green wood visible under the bark, results in a reduction of fruit. Vines also don’t have to be on fire to be destroyed; damage can occur from heat radiating from adjacent burning forest or buildings. The grimmest prognosis comes with high intensity damage. If a substantial part of the trunk is damaged, “no remedial treatment is justified.” If a small slice into the vine wood shows brown or discolored tissue, you’ve got “tissue necrosis, organelle leakage, and vessel or cell death.” Even slightly damaged vines are vulnerable to pathogens like fungi. And you have to give up or start over. Starting fresh—planting new vines—is not a quick solution. It takes at least three years for a vine to produce usable fruit. Usually the more mature a vine, the higher quality its grapes. Many of the Napa and Sonoma plants are 30–40 years old. A few, the family-owned vineyards like to say, are more than a century old—the same plants that were brought in the baggage of a European immigrant. Even after the fires are contained, a smoky haze will hang over Napa and Sonoma, creating another concern for the vintner called “smoke taint,” a term coined in Australia. Smoke damage is invisible, but volatile phenols in smoke can be absorbed by leaves and grape skins, then released at the time of fermentation, altering the flavor. The aroma of wine made from these affected plants is generously described as “like smoked fish.” Less generously the scent and the aftertaste are reminiscent of a “dirty ashtray.” The problem is worse for red wines because there is more contact between the wine and the grape skin. There is some hope that playing with adding oak chips or tannin additions at the blending stage could mask or remove the ashy effect. Researchers at university departments of enology and viticulture are at work pinning down the specifics of how the phenols are absorbed. Few vineyards want their label associated with soot. When harvesting began of the white wine grapes in August, 2017 looked like a good year. The most valuable grapes, for cabernet sauvignon, are harvested in September and October; some of that fruit was still on the vine when the fires began. Part of the mystique of wine is that each vintage has its character, good or bad. Winemakers are selling landscape, weather, a moment in time captured in a bottle. The 2017 cabernet sauvignon, probably smoke-tainted, could attract some truly quirky wine connoisseurs—once past the scratchy throat and watery eyes, they may appreciate tasting something unique. It’s still too soon to total the loss of the vines or the amount of smoke damage. But even if many of the vines come back, the loss of buildings, trellises, and irrigation systems is so large that the future of the business is still uncertain, a huge problem given that the two valleys provide the livelihood for tens of thousands of workers via their agriculture and tourism. Once we know the extent of the destruction of these valuable plants, what will we have learned? Australian wine researchers and growers are coming to the full realization that the dry parts of their very dry country are getting drier, thus more prone to bush fires. What the California wine country has just experienced is essentially a bush fire; with more drought years, there will be more fires.